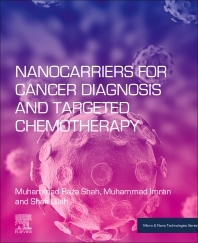 Nanocarriers for Cancer Diagnosis and Targeted Chemotherapy reviews the principles and applications of nanocarriers for targeted drug delivery. Drug targeting involves active and passive strategies that exploit both the use of ligands for interactions and the physical and chemical properties of nanocarriers and micro-environments at target sites. Multidrug resistance and adverse side effects associated with anticancer drugs have attracted greater scientific attention and led formulation scientists to specifically target these drugs to target sites. Nanocarriers like liposomes, niosomes, gold nanorods, carbon nanotubes, and micelles are discussed for the delivery of drugs to specific disease sites. This is an important reference source for researchers in the biomedical and biomaterials fields who want to gain an understanding on how nanotechnology is used for earlier diagnoses and more effective cancer treatment. Muhammad Raza Shah is a Full Professor at the International Center for Chemical and Biological Sciences, H.E.J. Research Institute of Chemistry University of Karachi, Pakistan. He is also the Head of the Center for Bioequivalence Studies and Clinical Research (CBSCR) and the recipient of numerous awards, including the civil award Tamgha-i-Imtiaz from President of Pakistan, and the Dr. M. Raziuddin Siddiqi Prize (2015) for Scientists under 40 in the Field of Chemistry by Pakistan Academy of Sciences. He has written over 200 peer-reviewed journal papers. Muhammad Imran is a graduate student and based at the International Center for Chemical and Biological Sciences, H.E.J. Research Institute of Chemistry University of Karachi, Pakistan. Shafi Ullah is a graduate student and based at the International Center for Chemical and Biological Sciences, H.E.J. Research Institute of Chemistry University of Karachi, Pakistan.